This podcast is all about helping you get dinner on the table, so I’ll be sharing some simple meal planning tips to help you get more organized. Need help getting started with Meal Planning? I was recently helping a client by designing them a meal plan because she happens to have a new job and just doesn’t have the time to plan. She also felt her health was slipping so having an easy meal plan was a great way to get her back on track without having to thin about it. And that’s what we are going to talk about today, meal planning and hopefully I’ll be able to provide some helpful practical tips on how to go about it. Are you a meal planner or do you just make things on the fly? I often set a plan because it saves money, saves time, saves stress, and stops you wandering off eating things you might not want to eat. You buy only what you need to make the meals, so there is much less food wastage, meaning you’re not throwing money in the trash. If you do have left over food items or things in the pantry you want to use up, then you can factor those into your meal plan and it saves you money. Also, if you stick to your list you stop making impulsive buys. Supermarkets often try to get us to make impulsive buys based on ‘specials’ but often we really don’t need or want those items. So keep your radars on and stick to the list because it really does save you money in the long run. Having a meal plan also saves you time, stress and wandering. Take a second to reflect on how much time you think about what you are going to have for dinner, or what you are going to take to work for lunch. If you don’t make a plan you have to think about it day in and day out and it takes time and energy. It can also lead to more stress if you’re left having to make decisions right at the last minute. Or you might go and grab take away because you’re feeling stressed and then you start beating yourself up because you didn’t eat as healthy as you’d like and so you become even more stressed. I think you get the picture and you’ve probably experienced these things yourself from time to time. But we don’t have to if we get into the habit of meal planning. So today I’ve got 10 meal planning tips to share that might help you get into a meal planning habit. Sounds like an obvious thing to mention but unless we take an hour or so to plan then the plan is never going to happen. Although planning does take time, I find in the long run it saves me time, energy, money and stress! I often do my shopping on Sunday mornings. In general I get up pretty early so I just spend time over a cup of tea and work out what the week might look like. You get better at it over time so just start somewhere, even if it’s just planning dinners at first. Schedule a time to do it. I look at my diary while I’m making a meal plan because then I can make sure I have the right meals prepared for the right time. If I’m going to be home late on Tuesday, I certainly don’t want to be short on time to cook and have to prepare tomorrows meals as well. So on days like this I will often have stuff in the freezer that I get out in the morning and throw together with a salad. Or I’ll put on a crockpot meal and leave it cooking on low all day so dinner is done when I get home. If I have my weekly schedule available while meal planning I can then also plan the times during the week when I might spend a bit more time in the kitchen. Batch cooking is my saviour when it comes to sticking to and planning my eating schedule with my day to day living schedule. I usually make extra cooking time on Sundays and prepare extra things for freezing and for those days when time is short. I might do this again during the week once if need be and I always say if you’re going to spend time cooking then why just make one meal, cook extra and eat twice or 3 times instead. Make big batches because it doesn’t take extra effort and it saves you washing up and cleaning time too and we’d all have to admit that washing up is our least favourite part of being in the kitchen. You might be able to keep the plan in your head but it’s probably not efficient to do it that way so write your plan down. 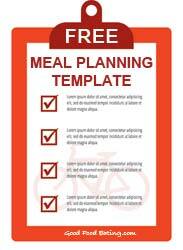 I use a meal planning template that I print out and write my meal plans down day by day, meal by meal from Monday through till Friday. I find planning for 5 days is usually sufficient because you might have leftovers or substitute for something along the way and it usually fills up the extra 2 days. 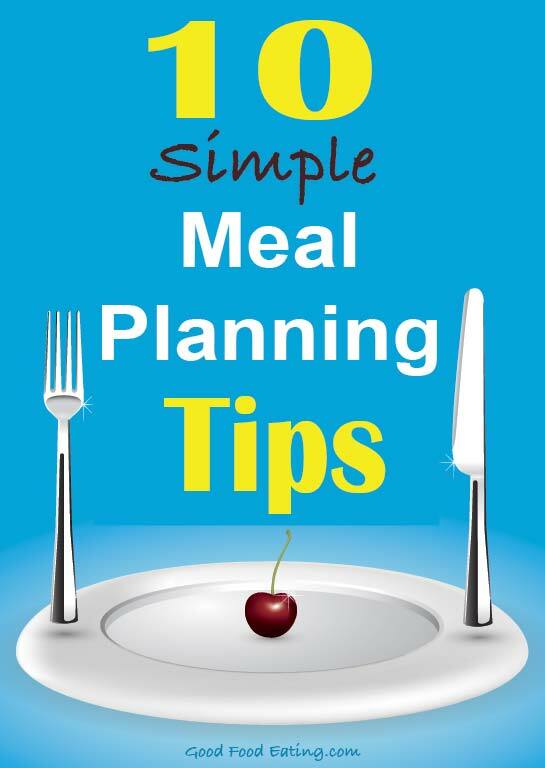 As you are making your plan think about the ingredients involved in each meal and how they might cross over from one day to another or one meal to another. That’s what I do and it means I can keep my produce and purchases within my budget and there won’t be any food that goes to waste. I really don’t like seeing food go to waste and in my house it rarely does. Writing a plan really helps to get clear on your week ahead and makes you stick to your routine better too. In fact I’ve got a meal plan template you can download from the GFE website after this podcast at GFE.com/57. You might find it helpful so head over there to download it. I like to keep my meal plans interesting so I try to throw at least one new recipe or flavour into the mix each week. There’s nothing worse than feeling like you want to cheat because you’re bored and it’s always good to keep things interesting! I like to include a variety of meats and vegetables and I also like vegetarian meals as well so I try to include different types of protein sources during each week, different red meats, some chicken and a bit of seafood, or I use different beans and legumes. That way my diet feels more balanced overall. I buy loads of vegetables of course but if I’m trying to stick to a budget and the vegetables I want are more expensive than I’d like, then I’ll just think about a cheaper option that is available and within my pricing budget and just replace that in the recipes I want to cook. You’ll be surprised that most vegetables are very versatile like that and can be easily replaced for another. Get a short list of super easy meals and recipes that you enjoy eating and post them on the fridge. Then when you go to make up your meal plans every week you can refer to your list and choose a few things you haven’t had for a while. You can also keep these in a note book and keep adding new recipes and meals to the list as you discover them. Then you don’t have to leave it to memory to think things up. When you have a list of ideas it also helps to keep your diet interesting and revolving so you don’t get stuck eating the same things every single week. I write my basic grocery list based on the meal plans that I have prepared for the week. As I said before sometimes certain ingredients may not be available so I substitute with other vegetables or meats if need be. I don’t know about you but I’m certainly no good without a shopping list. I forget a whole bunch of things and that’s fairly frustrating. I also make sure to stick to the list and don’t make impulsive buys. Even when we’re busy we do need to take time to appreciate our food and life too. And you have gone to all the effort of putting a meal plan together So make it a point to sit at the table or somewhere quiet like outside in the fresh air and focus on happiness and peace as you eat. It’s amazing what a difference even 10 minutes of relaxation while you eat can make. The worst thing you can do is eat in the car or on the run. Your body needs time to digest and you need time to enjoy it. Taking time to share a meal with people we love is also enjoyable, take a few minutes to set the table nicely and you’ll be surprised at how excited friends and family can be to share the food you make for them. I hope you’ve found these meal planning tips helpful and put them to good use. 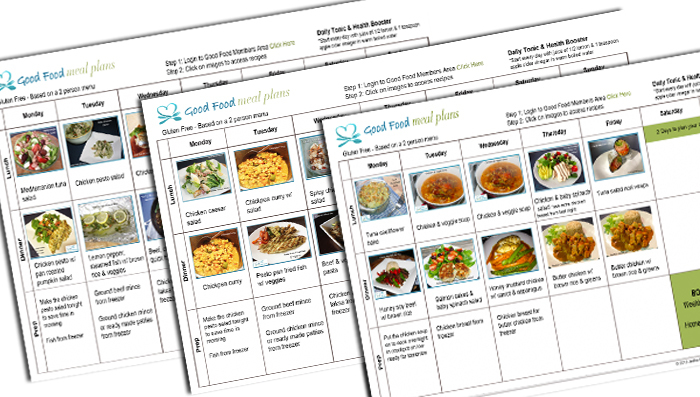 If you’re just the type of person who simply can’t plan or you’re too lazy to do it and would like it all done for you, you might like to check out the Good Food Eating weekly meal planning service. We do all the hard work for you by planning 5 lunches and dinners and we deliver the weekly meal plans and a shopping list to your inbox. Our meals are delicious, healthy and easy to make and you can choose from gluten free or paleo meal plans.